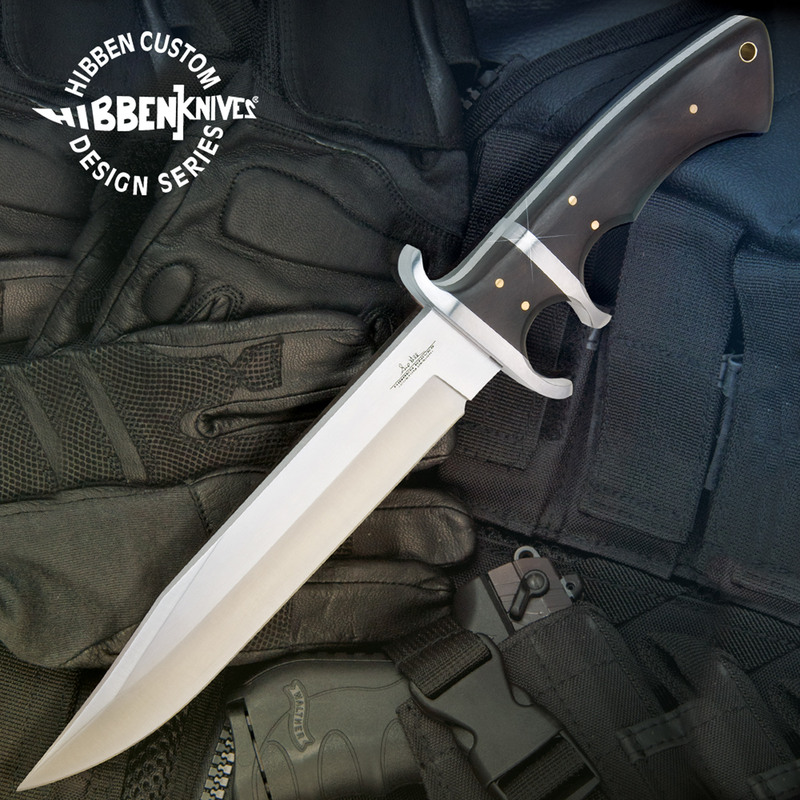 Witness Gil Hibben's take on a classic fighting knife design. This powerful fighter combines a trigger-grip handle with a full-tang blade to make a top grade functional, tactical knife. It offers a 7 1/2 in. razor-sharp, 7CR17 stainless steel, clip-point blade and a handle constructed with premium Micarta scales, nickel-silver pins and a nickel-silver lanyard hole. The guard, pommel and fittings are cast of stainless steel with a satin finish. Includes a custom leather belt sheath with the Hibben Custom Design logo stamped right into the leather and a certificate of authenticity. 12 in. overall. Extremely pleased with this one. Heavy, well balanced and well made.Razor sharp right out of the box. Worth EVERY dime!! 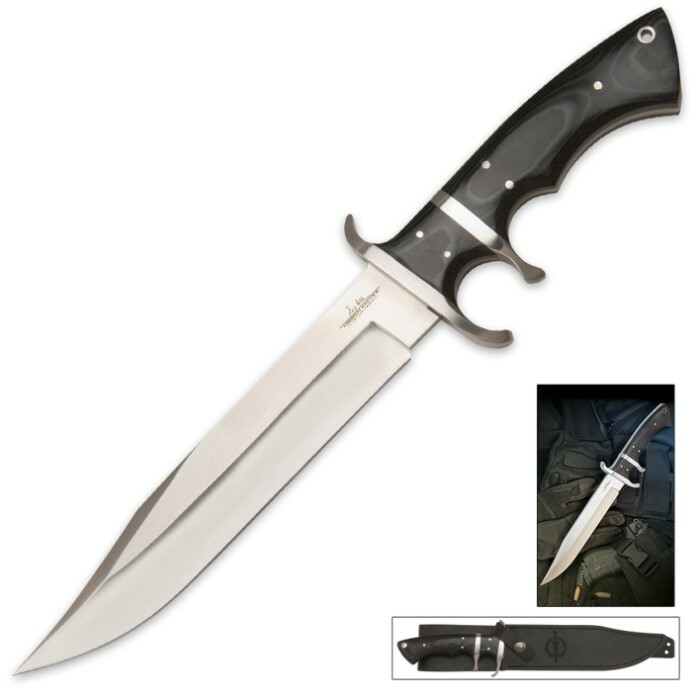 Highly recommended for anyone looking for an above average tactical assault blade. The design of this handle is absolutely amazing. It fits my Giant hands, and my wife's tiny hands comfortably. a well-designed knife all around. Well made, solid, sharp right out of the box. Nice balance. Feels great in hand. I got myself across the knuckle with this one! Just a graze but opened it right up. 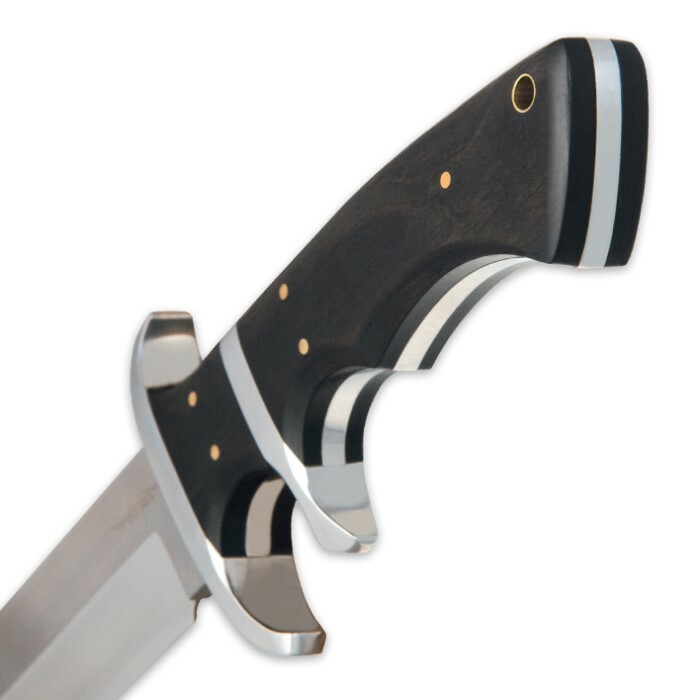 I really like the trigger guard style hilt on some of the Hibben knives. I just think it adds to the overall appearance of the knife, as well as to the feel of your grip, more secure. Something that no one else I know has in there collection. This knife is going to get used. I will have to buy a second one for display purposes because THIS blade is going to be used - a lot! This is a class act. It is what a Bowie style knife should be. I like the sub-hilt design of the handle. Mine came very sharp. It fits well in my hand. Love the balance. This is both art and functional. Impressive blade and for the money, unbelievable! The size and balance of this knife is extremely comfortable. The overall build and quality excellent for a China made knife. I guess the quality out of China has gotten a lot better than in the past. My favorite of all my purchases! Feels great on your hands,mighty powerful , you could conquer a battlefield with this authentic lethal weapon. I would sincerily recomend this precious fighting knive. I have had this knife for about 2 months and it is one of my favorites. I couldn't believe the design, quality and workmanship. Thanks for a great blade. Flawless. Perfectly weighted, came sharp, the sheath fits the knife like a glove, and it just feels plain RIGHT to hold. Not to mention it really is a pretty knife. My only complaint is that it doesn't have my initials engraved on it, but that's my own fault because of how excited I was to just get the thing ordered and on it's way to me. Definitely worth every dime. I always order my knives from trueswords and have yet to be disappointed with them.